An Efficiency Greater Than 1? No, my next project is not building a Perpetuum Mobile. Sometimes I mull upon definitions of performance indicators. It seems straight-forward that the efficiency of a wood log or oil burner is smaller than 1 – if combustion is not perfect you will never be able to turn the caloric value into heat, due to various losses and incomplete combustion. Our solar panels have an ‘efficiency’ or power ratio of about 16,5%. So 16.5% of solar energy are converted to electrical energy which does not seem a lot. However, that number is meaningless without adding economic context as solar energy is free. Higher efficiency would allow for much smaller panels. If efficiency were only 1% and panels were incredibly cheap and I had ample roof spaces I might not care though. The coefficient of performance of a heat pump is 4-5 which sometimes leaves you with this weird feeling of using odd definitions. Electrical power is ‘multiplied’ by a factor always greater than one. Is that based on crackpottery? Our heat pump. (5 connections: 2x heat source – brine, 3x heating water hot water / heating water supply, joint return). Actually, we are cheating here when considering the ‘input’ – in contrast to the way we view photovoltaic panels: If 1 kW of electrical power is magically converted to 4 kW of heating power, the remaining 3 kW are provided by a cold or lukewarm heat source. Since those are (economically) free, they don’t count. But you might still wonder, why the number is so much higher than 1. There is an absolute minimum temperature, and our typical refrigerators and heat pumps operate well above it. The efficiency of thermodynamic machines is most often explained by starting with an ideal process using an ideal substance – using a perfect gas as a refrigerant that runs in a closed circuit. (For more details see pointers in the Further Reading section below). The gas would be expanded at a low temperature. This low temperature is constant during heat is transferred from the heat source to the gas. At a higher temperature the gas is compressed and releases heat. The heat released is the sum of the heat taken in at lower temperatures plus the electrical energy fed in to the compressor – so there is no violation of energy conservation. In order to ‘jump’ from the lower to the higher temperature, the gas is compressed – by a compressor run on electrical power – without exchanging heat with the environment. This process is repeating itself again and again, and with every cycle the same heat energy is released at the higher temperature. The efficiency of a heat pump is the inverse of the efficiency of an ideal engine – the same machine, running in reverse. The engine has an efficiency lower than 1 as expected. Just as the ambient energy fed into the heat pump is ‘free’, the related heat released by the engine to the environment is useless and thus not included in the engine’s ‘output’. One of Austria’s last coal power plants – Kraftwerk Voitsberg, retired in 2006 (Florian Probst, Wikimedia). Thermodynamically, this is like ‘a heat pump running in reverse. That’s why I don’t like when a heat pump is said to ‘work like a refrigerator, just in reverse’ (Hinting at: The useful heat provided by the heat pump is equivalent to the waste heat of the refrigerator). If you run the cycle backwards, a heat pump would become sort of a steam power plant. The calculation (see below) results in a simple expression as the efficiency only depends on temperatures. Naming the higher temperature (heating water) T1 and the temperature of the heat source (‘environment’, our water tank for example) T2 …. The important thing here is that temperatures have to be calculated in absolute values: 0°C is equal to 273,15 Kelvin, so for a typical heat pump and floor loops the nominator is about 307 K (35°C) whereas the denominator is the difference between both temperature levels – 35°C and 0°C, so 35 K. Thus the theoretical COP is as high as 8,8! 40 / 35 = 1,14. 6035 / 35 = 172. So, as heat pump owners we are lucky to live in an environment rather hot compared to absolute zero, on a planet where temperatures don’t vary that much in different places, compared to how far away we are from absolute zero. Chapter 44 of Feynman’s Physics Lectures Vol 1, The Laws of Thermodynamics. 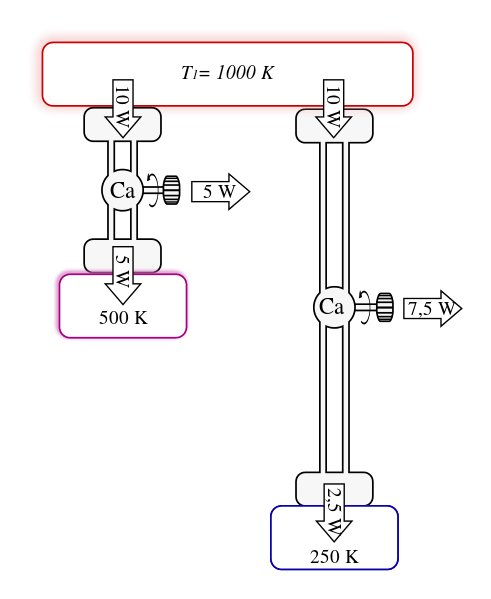 For an ideal gas heat energies and mechanical energies are calculated for the four steps of Carnot’s ideal process – based on the Ideal Gas Law. The result is the much more universal efficiency given above. There can’t be any better machine as combining an ideal engine with an ideal heat pump / refrigerator (the same type of machine running in reverse) would violate the second law of thermodynamics – stated as a principle: Heat cannot flow from a colder to a warmer body and be turned into mechanical energy, with the remaining system staying the same. Pressure over Volume for Carnot’s process, when using the machine as an engine (running it counter-clockwise it describes a heat pump): AB: Expansion at constant high temperature, BC: Expansion without heat exchange (cooling), CD: Compression at constant low temperature, DA: Compression without heat exhange (gas heats up). (Image: Kara98, Wikimedia). What had puzzled me is once why we accidentally latched onto such a universal law, using just the Ideal Gas Law.The reason is that the Gas Law has the absolute temperature already included. Historically, it did take quite a while until pressure, volume and temperature had been combined in a single equation – see Peter Mander’s excellent article on the historical background of this equation. Having explained Carnot’s Cycle and efficiency, every course in thermodynamics reveals a deeper explanation: The efficiency of an ideal engine could actually be used as a starting point defining the new scale of temperature.